Welcome to the Caltech Microanalysis Center(CMC), which is a new research establishment within Caltech's Division of Geological and Planetary Sciences that provides hardware and expertise for microanalysis of geological, meteoritic and synthetic materials. 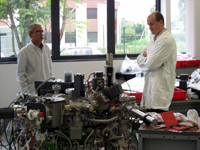 The CMC consists of three major components: A laboratory that houses advanced instruments for in situ chemical and isotopic analysis of solids; a program of instrument and methods development grants to encourage 'in house' invention and innovation of micro-analytical techniques; and a program of graduate and postdoctoral training. The CMC complements Caltech's existing analytical facilities, and is fostering a new growth in interdisciplinary research among geochemistry, planetary science, biology and material science and engineering.